Personal: Single...First job was as a disability support worker...Holds certificates in assisted care...Enjoys golf and poker. 2019: Finished third in Roth-Holman Doubles with Anthony Lavery-Spahr losing to Sean Rash and Matt Ogle 258-216 in semifinal match. Career: In 2017 finished third in PBA Cheetah Championship eliminated in Shootout match with 236. 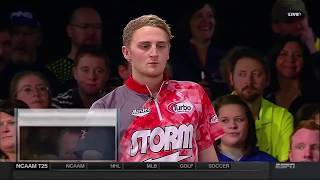 Had career top finish of third in 2016 Barbasol PBA Players Championship...Finished eighth in 2016 PBA Shark Championship. ...Multi-madalist in World Youth Championships and Commonwealth Championship.